Ever wonder what is sometimes involved with trying to get a government agency to answer what should be a simple question? I thought I’d give people a picture of how I spent my entire afternoon, Wednesday, May 24, 2018, trying to find out the name and position title of the attorney who was present, on behalf of the Washington State Department of Labor & Industries (L&I), at a May 23, 2018, Whatcom County District Court proceeding. The proceeding involved Sarbanand Farms, located in Sumas, Washington, and L&I. I was seeking the attorney’s name to include in an article I was putting together about the May 23, court proceeding. Originally, Sarbanand Farms had requested a hearing to contest the $73,000 penalty it had been assessed by L&I for committing 13 violations of employment standards in the summer of 2017. Those violations entailed the farm having failed to provide hundreds of its workers all the required rest breaks and timely meals during what was a 15-day period in July 2017. Those violations were discovered during L&I’s investigations of Sarbanand Farms initiated in August 2017, after the death of a young H-2A worker from Mexico, Honesto Silva Ibarra. Mr. Silva Ibarra died on August 6, 2017, at a Seattle hospital, after becoming very ill while working at Sarbanand Farms. L&I had only requested records from Sarbanand Farms for a specific 15-day period in July, and its investigation found that the farm failed to provide 7 rest breaks and was late in serving meals on 6 occasions for hundreds of its workers. On Wednesday, May 23, 2018, at the court proceeding in Whatcom County District Court, the attorney in the courtroom on behalf of L&I, walked, unsolicited, over to a group of attendees of the proceeding, most of whom were wearing black T-shirts with the words, “Ernesto Silva Ibarra Presente” displayed on the front. The attorney directed them out into the hallway to tell them that nothing would really be happening that day in court, and that instead, there would be a mitigation hearing on June 23, 2018. That group of people decided to return to the courtroom to watch the proceeding, and in watching, they learned that actually the attorney who told them that the mitigation hearing would be on June 23, had given them the wrong date, and it had been agreed upon that the hearing would be scheduled for June 19. To my best understanding, this means there will now be communications and/or documents being submitted by Sarbanand Farms and L&I. Sarbanand Farms will likely be seeking a reduction in the penalty amount assessed to the farm. Keep in mind that L&I already had greatly reduced the penalty amount it assessed the farm in February of this year. The public will not be privy to those mitigation communications between L&I and Sarbanand Farms, and whatever is agreed upon by the department and the farm will then be presented to the judge at the June 19 mitigation hearing. Again, this is to my best understanding of the information provided to me, so far. So, that same afternoon, I called the Whatcom County Prosecutor’s office Administrative Manager, Kathy Walker, and asked if she could confirm for me if Gordon Jenkins, from the Whatcom County Prosecutor’s office was the attorney handling the May 23 proceeding in Whatcom County District Court, as that was what I was told by the communications director for the AG’s office. Ms. Walker said that there was not an attorney from the County Prosecutor’s office there for that proceeding. She added, “We are not involved at all in this office.” Ms. Walker then directed me to contact James Mills, who she said is the Senior Counsel for the Tacoma Division of the AG’s office, as he is handling the Sarbanand Farms matter. Right after hanging up with Ms. Walker, I contacted Mr. Mills and left a voice mail for him, as I wanted to get the name and job title of the attorney in the courtroom on May 23. He must have then forwarded my voice mail to the communications director for the AG’s office because I received an email from Ms. Aho late in the afternoon on May 24, letting me know, politely, that, per the AG’s office’s media policy, my contact should be through her. After trying very hard on May 24 to obtain and confirm the name and position title of the attorney who was there at the May 23 District Court proceeding, I never was able to obtain official confirmation from either the Whatcom County Prosecutor’s office or the AG’s office that the individual was, in fact, Whatcom County Criminal Deputy Prosecutor, Gordon Jenkins. 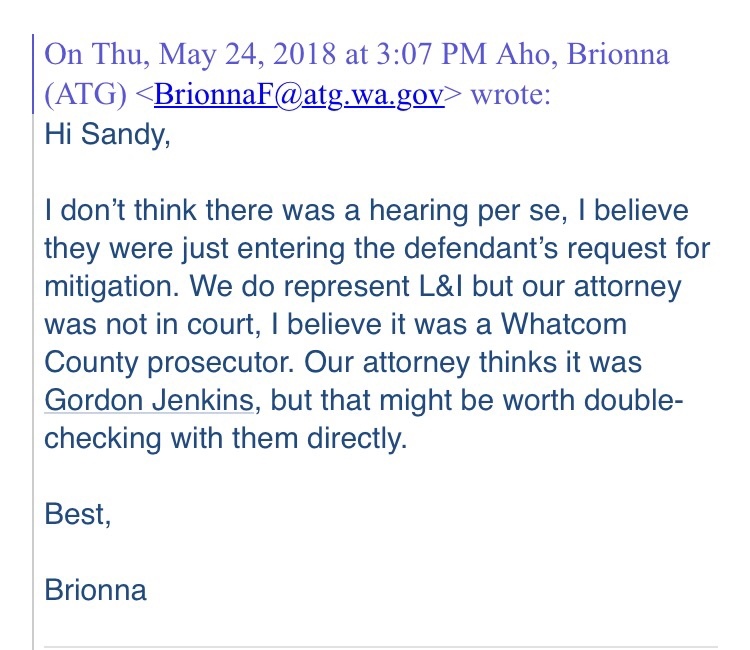 I was able, however, to confirm, by finding a photo of Gordon Jenkins’ on his LinkedIn page, that he was the attorney, who on May 23 in Whatcom County District Court, was presenting an order on behalf of the AG’s office and L&I, to the judge. That confirmation was made by a person who had attended the proceeding who was able to confirm that for me on Thursday evening, after I showed her Mr. Jenkins’ LinkedIn photo. Why did the AG’s office, representing L&I, have a Whatcom County Criminal Deputy Prosecutor handling the May 23 court proceeding for them? Why wouldn’t the Whatcom County Prosecutor’s Office Administrative Manager just provide me the name and job title of the person handling the proceeding, since, as it turns out, it appears that it was one of the prosecuting attorneys from Whatcom County Prosecutor’s office? 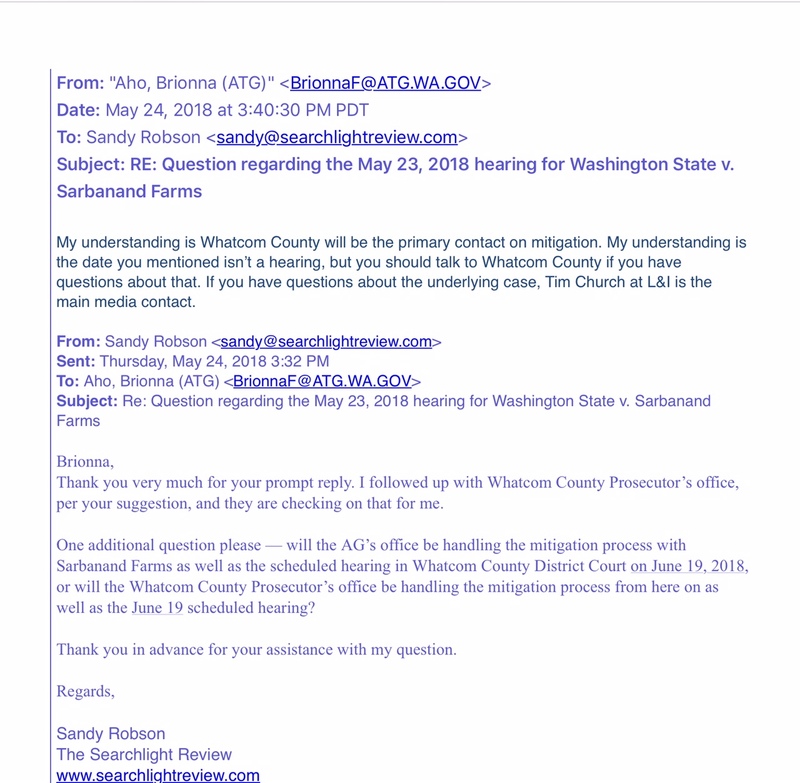 Is the Whatcom County Prosecutor’s office primarily handling the mitigation with Sarbanand Farms and L&I as the communications director for the AG’s office stated in her May 24 email, or will the AG’s office be primarily handling the mitigation? Will our community pay attention to this matter and urge L&I not to reduce the already reduced penalty it assessed to Sarbanand Farms? It remains unclear, however, just how the hot, smoky working conditions combined with multiple missed rest breaks and late meals on the days leading up to August 2, the day that Mr.Silva Ibarra had to be taken by ambulance from the farm to a local hospital in Bellingham, may have contributed to him becoming seriously ill, and his eventual death. Additionally, it remains unclear whether Sarbanand Farms provided needed, proper medical attention and assistance to Mr. Silva Ibarra on the days leading up to August 2, because according to public records obtained from L&I, some of Mr. Silva Ibarra’s co-workers told L&I staff during their investigation, that Mr. Silva Ibarra had complained of feeling ill to farm management, but that was ignored. I am using the general term “farm management” in recounting the statements given by Sarbanand Farms’ H-2A workers interviewed by L&I, because it is not clear in some of the interview notes whether the farm workers providing testimony were referring to crew bosses or supervisors, etc. One worker interviewed by L&I said, “They were refusing to help the person who passed away,” and added that was what prompted the workers to strike. Approximately 75 H-2A workers at Sarbanand Farms went on strike on August 4, 2018, two days after Mr. Silva Ibarra was taken to the hospital. Those workers who had gone on strike were fired by Sarbanand Farms the next day, on August 5. Another worker told L&I staff interviewing him that many workers who got sick had issues with lungs and heat, perhaps working in smoky conditions and extreme heat at that time. L&I staff’s investigation notes showed a worker told them that workers asked why Sarbanand Farms did not take Mr. Silva Ibarra to the hospital sooner, and they were fired. Out of the approximate 600 H-2A workers who were employed by Sarbanand Farms during the summer of 2017, L&I, for its employment standards investigation, only interviewed 40 workers. The records do not explain why only 40 out of approximately 600 workers were interviewed. A number of those 40 workers told L&I staff that they were made to work even when they felt ill, and they said there was no medical treatment available. Workers also informed L&I staff that they were told they would be sent back to Mexico or deported if they complained of being sick/ill, and were told to get back to work. L&I records show that a farm worker said during an interview that a co-worker’s face became paralyzed and was not sure of the reason. He said that a co-worker had to pay for his own medical treatment and the farm didn’t help the worker get home to Mexico so he had to find his own way home. Records also show that a worker interviewed by L&I said that anytime anyone would speak up or complain, they were threatened with termination. The interview notes stated that the worker was one of the workers that got sick and the farm refused to get help for him. He had horrible headaches and sharp pains in his right ear. “His kidneys were hurting, and it hurt to go pee.” He reported it, and the woman who he reported it to did not do anything about it. From the notes, it appears the woman was identified by the worker as a crew boss for his crew, since he could not remember her name. One worker told L&I during his interview that a co-worker of his had horrible nosebleeds and headaches while working and Javier Sampedro, Sarbanand Farms orchard manager, discouraged him from seeking medical attention, and had told the worker it would cost over $2,000 to visit the doctor. He also told L&I that his brother, who was also working at the farm, was suffering from extreme headaches and nosebleeds at work which they (he and his brother) thought might be connected to working conditions and/or pesticides. He added that workers were prohibited from having/making friends outside of the farm, and if they violated that rule they were punished and were threatened to be sent back to Mexico. Some workers said they were told when they were hired that unless they were dying or on their deathbed, that the farm would not take them to the hospital for treatment. It is unclear in the notes when the workers say “they were told,” whether that was Sarbanand Farms’ management telling them that, or if it was the H-2A employment agency staff that told them that. Reading through all of the interview notes contained in the investigation records that L&I provided was heartbreaking, to me. H-2A workers leave their families in Mexico to come to the United States for what seems to them is a good opportunity for their futures, and for their families’ futures. Businesses like Sarbanand Farms are entrusted with treating those H-2A workers well and fairly, but when I read the pages and pages of notes of the interviews with the 40 workers who L&I interviewed, it appears to me that Sarbanand Farms failed their H-2A workers, and it appears that all of us who make up the United States of America failed those workers. As Rosalinda Guillen, Executive Director of Community to Community organization, said last year at a community forum to educate people about the H-2A visa program, the death of vulnerable farm workers who work to provide our food is on all of us. After reading all of L&I’s records provided to me relating to the multiple investigations of Sarbanand Farms initiated by the department in August of 2017, I think an independent investigation into the treatment of farm workers at Sarbanand Farms and the death of Honesto Silva Ibarra in the summer of 2017, is warranted. 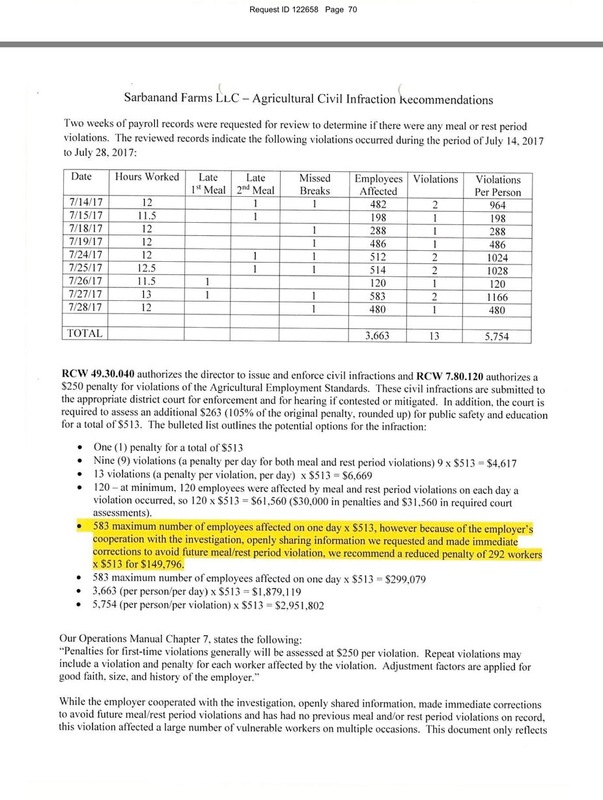 In the meantime, the notes of interviews L&I conducted with the 40 workers, along with the knowledge that Sarbanand Farms failed to provide all the required rest breaks and timely meals for its workers, cause me to conclude that the $73,000 penalty assessed to Sarbanand Farms by L&I was not nearly large enough. I say that especially in light of the fact that, according to L&I documents, one of the options that L&I could have selected in terms of the dollar amount of the penalty its department could assess Sarbanand Farms, was a penalty of $2,951,802.00. At the very least, during the mitigation currently going on between the farm and L&I, their department should not give the farm any further reduction to the $73,000 penalty amount. To do so, would add insult to injury, and would send a message to workers that they cannot count on L&I to do its very best to protect workers’ safety and health on the job. This article was updated on May 30, 2018. 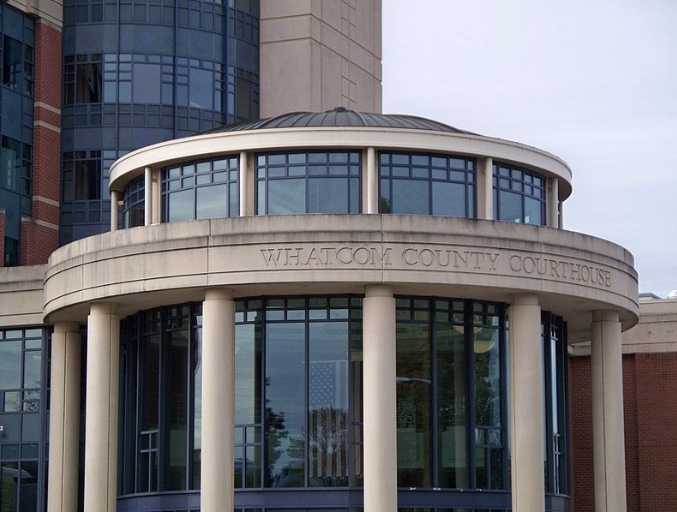 This is an outstanding expose of the problems we are dealing with in Whatcom County with the Prosecutors office, with the administration of justice. Thank you for doing this deep research. This is an excellent article, meticulously researched. Thank you Sandra for caring and devoting the many, many hours I know it must have taken to glean this information, and then put it to pen and paper. Citizen journalism….think back to the Thomas Paine….One Citizen Can, one citizen at a time, make a difference. I am so sad that American companies continue to use essentially slave labor to feed our food needs. We do not cherish the fresh food available to us – we waste it and complain about prices, and we are entirely disrespectful of the back-breaking work it takes to pick our fruits and vegetables. AND, we don’t treat animals any better, another topic Sandra has investigated, poignantly and thoroughly, since embracing her citizen journalism contribution. I hope readers will like the article and share it on their Facebook and Twitter pages.